Direct deposit is the automatic deposit of paychecks, government checks (Military retirement, civil service, Social Security, V.A. 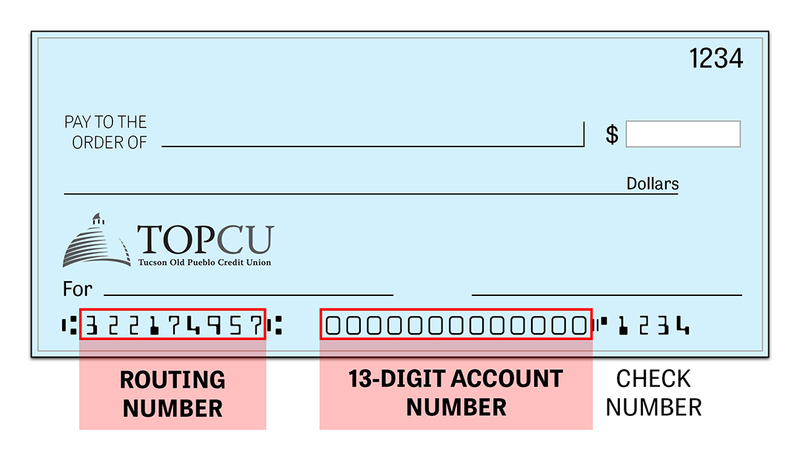 compensation), and other checks to your TOPCU accounts. It speeds up the process of getting your money into your accounts, and eliminates the cost and time associated with printing and cashing checks, postage and trips to the credit union. Check with your employer’s payroll department to see if they are set up to process direct deposit. Once direct deposit is established, we will distribute your funds to any of your TOPCU accounts that you specify. Remember to use the TOPCU Routing Number 322174957 and your Member Number. Be sure to let us know which account(s) to deposit funds into (savings, checking IRA, etc.). See the example below. If you do not have a check to reference, please contact our service team at (520) 881-6262 ext. 702 for assistance.